Stringent regulations on emission and fuel efficiency, government schemes towards adoption of electric vehicles coupled with need for pollution free environment are few of the factors contributing to the growth of electric vehicle powertrain systems market in India. The growth of electric vehicle market is also critical for energy transition in the country, reducing the reliance on oil imports and escalating the demand for renewable power. Further, technology improvement, cost reduction and local manufacturing of lithium ion batteries are expected to catalyze the growth of EV market in India. According to 6Wresearch, India electric vehicle powertrain market size is projected to grow at a CAGR of over 26% during 2017-23. Battery EV powertrain systems captured majority of the India electric vehicle powertrain market share in terms of revenues, owing to the subsidies and tax rebates offered by government to EV users and manufacturers. Although, charging infrastructure challenges are still present, however government's target of 6 million EVs on roads backed by its firm actions is likely to overcome these challenges during the forecast period. In 2016, two wheeler EV registered majority of the market volume, however, as a result of rising income level coupled with cost reduction of electric cars, the passenger car segment is anticipated to register highest growth in the India Electric Vehicle Powertrain Market forecast period. The India electric vehicle powertrain market report thoroughly covers market by technologies, components and vehicle types. 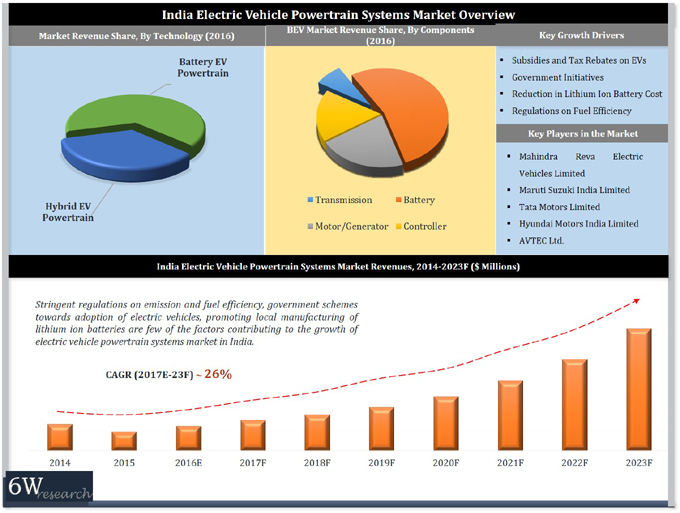 The India electric vehicle powertrain market outlook report provides an unbiased and detailed analysis of the on-going India electric vehicle powertrain market trends, opportunities/ high growth areas, market drivers which would help the stakeholders to decide and align their market strategies according to the current and future market dynamics. 15.1	Mahindra Reva Electric Vehicles Ltd.